Further cementing Macau’s reputation as the birthplace of motorsport champions, the Automobile General Association Macao-China (AAMC) today announced that Macau will host the 2009 CIK-FIA World Karting Championship from October 8-11 at the Kartodromo de Macau, the first time the event has been held in Asia. The CIK-FIA World Karting Championship, which over the years has helped launch the careers of racing stars such as Ayrton Senna, Michael Schumacher, Lewis Hamilton and Robert Kubica, is the sport’s most prestigious title. Next month, fans across Asia will have the opportunity to witness motorsport history, and watch potential Formula One champions in action. Entrance to the four-day event is free of charge. One hundred and seventy karters from 20 countries and regions will take part in the event, one of many celebrations being held this year to mark the 10th anniversary of the founding of the Macau Special Administrative Region. In addition to the headline events, the 2009 CIK-FIA World Karting Championship and the 2009 CIK-FIA Karting Asia-Pacific KF3 Championship, the programme includes numerous support races as part of the 2009 Macau International Kart Grand Prix. All three of last year’s CIK-FIA World Karting Championship podium finishers will make the trip to Macau, with reigning champion Marco Ardigò (ITA) seeking a third consecutive crown. Libro Toman (CZE) and Gary Catt (GBR), who placed second and third respectively in 2008 also return, each looking to take their first title. Four-time world champion David Forè (ITA) is hoping to supplant Ardigò from the top spot. The two compatriots have won five out of the past nine championships. Two-time Macau Karting Champion João Afonso will make his world championship debut on his home circuit, becoming the first Macau karter to compete at the pinnacle of the sport. Young karting and single seater drivers David Zhu and Cao Hongwei represent China in the championship, while Wong Tim Wai and Vica Chong Chuen Yee are the neighbouring Hong Kong SAR entrants on the 42-kart field. Matthew Solomon will represent Hong Kong in the CIK-FIA Asia-Pacific Championship KF3. The headline races feature 58 competitors from 19 different countries and regions, further demonstrating the international appeal of the sport. In the supporting Asian Karting Open Championship races, a total of 112 competitors from nine different countries and regions will compete in Macau. A sport in its own right, innovation is a priority for the CIK-FIA governing body. At a race meeting in Sarno, Italy in August, miniature on-board cameras were introduced in all heats and finals in the junior KF3 category, allowing race officials to better observe the drivers’ actions on track. The result was an intense KF3 final, featuring numerous overtaking maneuvers and, just as importantly, fair and sportsmanlike competition from the drivers. Karting is one of just four motorsport disciplines designated FIA World Championship status, along with Formula One, rallying and touring cars. Organized by the AAMC, the historic first is supported by the Macau Sports Development Board and the Macau Government Tourist Office. The Commission Internationale de Karting (CIK) is the official commission of the sport for the Fédération Internationale de l’Automotible (FIA), the world governing body of motorsport. Macau’s commitment to the development of motorsport, and its storied motor racing culture, aligns perfectly with the 2009 CIK-FIA World Karting Championship. Karting has long been the traditional first step in a motorsport career, with Formula One drivers such as Senna, Schumacher, Hamilton, Kubica, Kimi Räikkonen, Nico Rosberg, Jenson Button, Jarno Trulli, Heikki Kovalainen and Vitantonio Luizzi all having competed in the CIK-FIA Karting World Championship. Trulli won the championship in 1991, and finished second two years later, while Luizzi was the 2001 winner. Kovalainen finished third in 2000, and Senna, who became the first Macau Formula 3 Grand Prix champion in 1983, was second on the podium in 1979 and in 1980. While it is impossible to predict who the future Formula One World Champions will be, it is likely that they will have come through Macau, competing in the Macau Grand Prix or, perhaps, the 2009 CIK-FIA World Karting Championship. Attracting this prestigious international championship is just the latest of many sporting achievements for the Macau SAR. In addition to its major annual fixtures such as the Macau Grand Prix, Macau Marathon and Macau Golf Open, the SAR has played host to a number of high-profile multi-sport events including the 2005 East Asian Games, the 1st Lusofonia Games in 2006, and the 2007 Asian Indoor Games. 2100: The length (in metres) of the camera cables used by the CIK-FIA for the video control of starts and races. Bridgestone Cup - Des lots grandioses, un final en apothéose ! 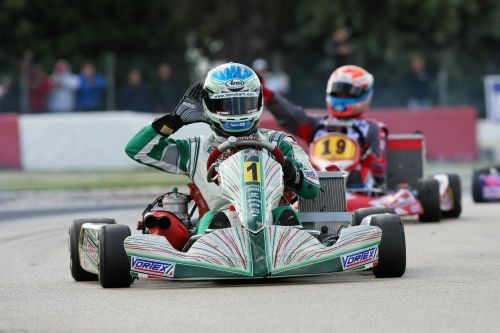 Ed Brand is European Junior Max vice-Champion!